This entry was posted on Friday, April 15th, 2011 at 3:06 pm	and is filed under Coding, PID. You can follow any responses to this entry through the RSS 2.0 feed. You can leave a response, or trackback from your own site. Why do you set the Iterm=output? This is a really fantastic blog that gives a really good balance of practical problem->solution stuff and enough background to give it context. I’m still geeking out, and my inner nerd has ‘horny rimmed glasses’ over this. I jest ye not! Hoping to adapt this to Arduino PID temp controller and maybe notsowobbly wobblebot. Thanks. 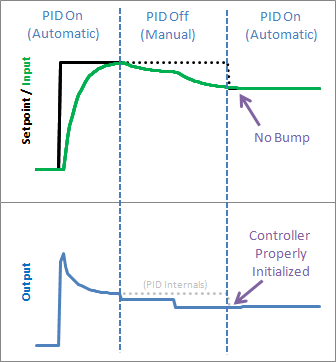 This series of posts helped me a lot in developing pid controllers for freescale car competition. I have the same question as Paul; why do you set Iterm = Output if Output has not been updated since you were last in manual mode? Shouldn’t Output = 0 and then start integrating as soon as the next error is calculated on the new output? Thanks for putting in the effort of explaining PID in such an intuitive way. I have been on control courses which leave you with less understanding! 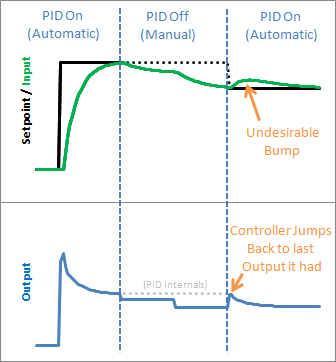 It looks like if SetMode(AUTOMATIC) is repeatedly called the PID will continually initialize. I need to add a variable to detect if the previous Mode was MANUAL and only then initialize. Nevermind, needed to read one line down. I see where you are detecting the transition. he used iterm = output , because the integration part is the most affecting part and others affect much much less. Note: the output IS the last manual desired setpoint, so the last output is chosen not from the pid equation but from the user.